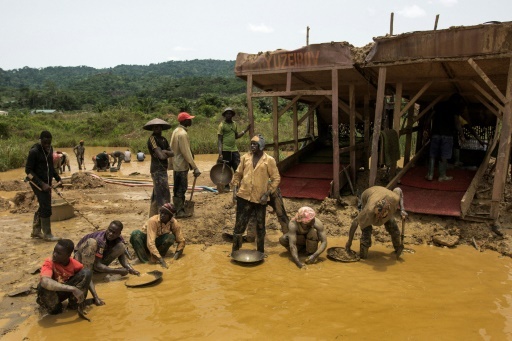 A group of galamseyers, illegal gold panners, working in the Kibi area of Ghana, long known for its bountiful gold reserves. Ghana has long been known for its bountiful gold reserves and was called "the Gold Coast" during its colonial era. But illegal mining in Africa's second largest producer is taking a heavy human as well as environmental and economic toll with more than $2 billion lost to the practice last year alone. Campaigners have been lobbying against illegal mining—known locally as "galamsey"—since February when local media revealed the dramatic impact that the practice, which often uses mercury, was having on Ghana's soil and water supply. While illicit prospecting has long been an issue for Ghana, the new government elected in December has now made combatting it a priority. It issued a temporary ban on all small-scale mining and is forming a plan due to be released in September to end the phenomenon permanently. Security forces recently clashed with illegal miners in the Ashanti region, leaving one miner dead. The incident in the town of Obuasi was a result of "Operation Vanguard", which has seen 400 members of the security forces deployed to take on the illegal miners. Abraham Otabil, a spokesman for the natural resources ministry, told AFP that while illegal mining was damaging rivers and farm land, it was also having a serious economic impact. The ministry believes that more than $2.2 billion (1.87 billion euros) was lost to illegal mining in uncollected taxes in 2016. Around half of all small-scale mining operations are illegal, the government estimates, suggesting that the cost of the problem could be larger still. Since 2006 gold has been Ghana's main source of foreign currency. And while illegal mining has decreased since the government crackdown, rogue operators continue to defy the authorities.